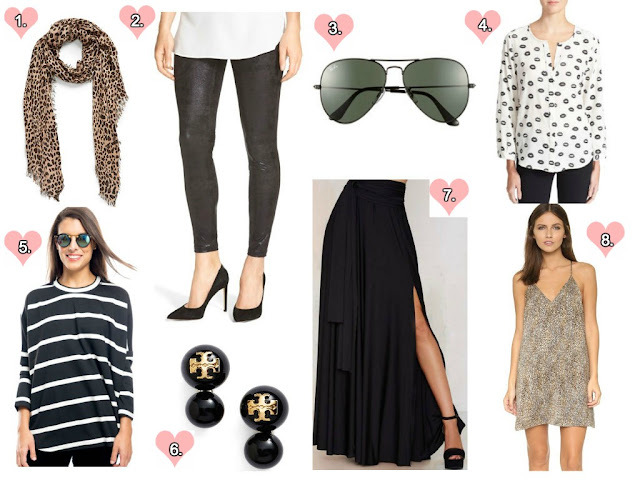 I should preface this by calling it the week of shopping black and leopard. Apparently I am in full blow Winter mode and only have black and serious animal print. I didn't even realized how bad my shopping tunnel visions has been until I edited this picture collage. I guess the positive side is that if I bought of all these things, I could easily mix and match them all! Let's talk about accessories first. Starting with these. I keep seeing the Kardashians rocking them in black and think it looks so chic and sporty at the same time. You can never go wrong with a leopard scarf, especially a lightweight one that can be used through multiple seasons. I have been on the hunt for the perfect pair of black earrings for a long time, like years long. I think these may be ladylike enough and preppy enough for me to fit the bill! I am legitimately obsessed with these leggings, I just want to know how they fit before I purchase! I also adore this blouse, plus it's on sale for almost 50 percent off right now! How easy-preppy-chic is this sweater? I love the stripes, because, duh, stripes always. I am kicking myself for not snagging this skirt for New Years Eve. It would have been such an amazing piece to work with and for future vacays. Sizes are selling out super fast in it (including mine) so my fingers are crossed that they restock! Speaking of vacay, I snagged this dress in a different color on sale and love it. It's the best for a tropical trip or Summer. I'm wondering if I should exchange the color I got for the leopard though, because I love it so much and think it would be uber flattering with a tan. Fabulous picks, lady! Love the stripes and the polka dots and the maxi skirt is so functional. So many cute things. Love the look of those leggings! Okay I need that black skirt in my life. Now I will continue to stalk the website until it is restocked! Love the leopard scarf! I don't currently own one, and this one looks very cute! I love that swing sweater - so bummed it's out of stock! And those Tory earrings are so fun and different, too!